Back in the day, Internet Explorer was one of if not the best internet browser around. Microsoft made it the de facto internet browser by already having it installed on all Windows operating systems. It was easy, it did it’s job, and it did it fairly well. In recent years, more and better browsers have been popping up. Mozilla Firefox and Google Chrome have been the best that have popped up. There is also Opera, Safari, Maxthon, Seamonkey, and many, many more. Heck, even Gmail and Facebook have their own built-in browsers. All of these are better options than Internet Explorer. 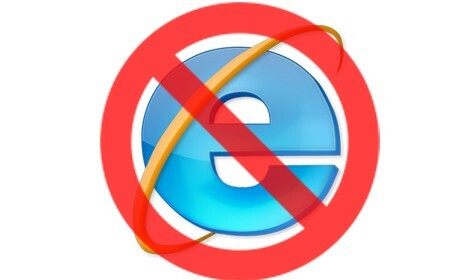 Microsoft has ended support for Internet Explorer. They are not updating it. They are not fixing it. If there are problems, Microsoft says oh well. This is because they are putting all of their eggs in the Microsoft Edge basket. Out with the old and in with the new. We aren’t fond of the Microsoft Edge browser but it is even better than Internet Explorer at this point. There is only one reason and one reason only you should use Internet Explorer, old websites that won’t work with newer browsers. A lot of government websites aren’t updated to the newest technology and therefore still rely on older internet browsers like Internet Explorer. If you aren’t using these websites, delete Internet Explorer from your desktop, taskbar, and start menu. Get rid of it and never use it again. More and more phishing scam websites are popping up through Internet Explorer. Chrome, Firefox, and other browser have been doing a better job at weeding out these phishing scam websites. You know the ones where they say “DON’T TURN OFF YOUR COMPUTER OR EVERYTHING IS DELETED, JUST CALL THIS NUMBER HERE,” yeah, those ones. Save yourself the hassle and the call to your tech team by just using a different, newer, better browser. Get rid of the Internet Explorer dinosaur.